May 14, 2015 - Reading time: 4 minutes. Back in 2011 I got a Kindle 4 (the non-touch version) and for some time it was the primary device for reading, be it ebooks, technical documentation or slides and transcripts from university. But then I was using it less and less and for the last one and a half years it basically layed around unused. While it is a good device for book reading, it isn't for other content. It's slow, it can't handle PDFs properly (zooming is just awful) and adding notes is really annoying with that on-screen keyboard. 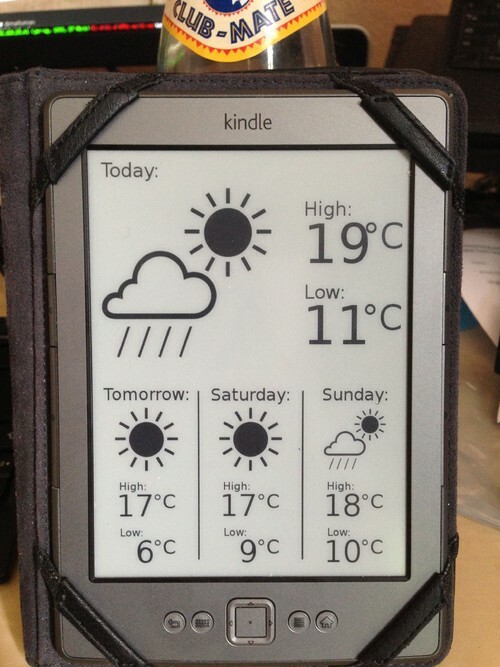 For some time now I have this link saved: Kindle Weather Display. Well, what better to do with a lazy holiday then doing some hacking with the Kindle? 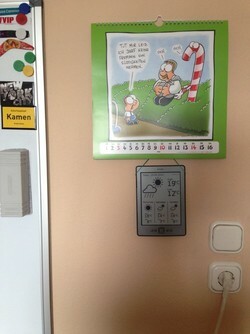 And so I did and this is the current result: It displays the weather forecast. As the original article is quite short on the precise steps to get this finished, I wanted to write them up here. Now you can also enable auto-starting USBnet. Caution: As long as USBnet is running, you can't mount the Kindle. Next, reboot your device. Once it's back up you should be able to connect to it via SSH on the IP it has in your WiFi network. The root password is either mario or of the form fionaABCD. Use the Kindle root password tool to find out based on the serial number. This will disable the framework (= the Kindle UI basically) and the power management daemon (= responsible for disabling WiFi and switching to the screensaver if idle for too long). In case you want to get back to the old state, just enable framework and powerd again (and first remove the init-weather.sh which will otherwise directly disable them again). The display-weather.sh script now does the hard stuff, which is pretty easy: Clear the screen, get a new image, display it. 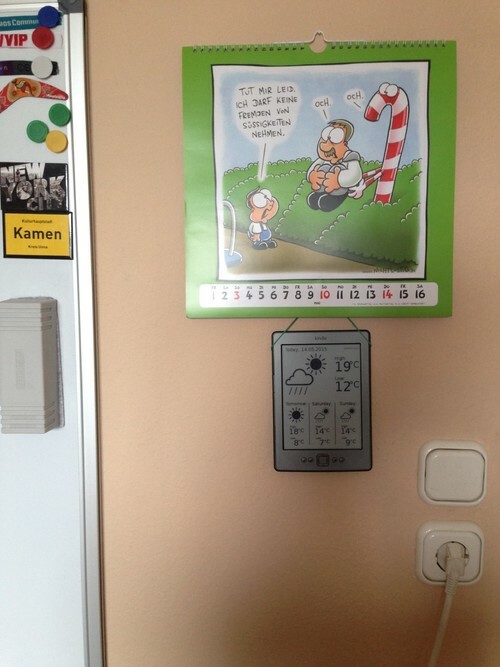 eips is the tool to write something on the screen or display an image. The script will now be executed every day at 7:00 and 19:00, showing a picture from the internet (well, at best it's a picture you generated). Thanks to @e2b for proofreading a draft of this post.